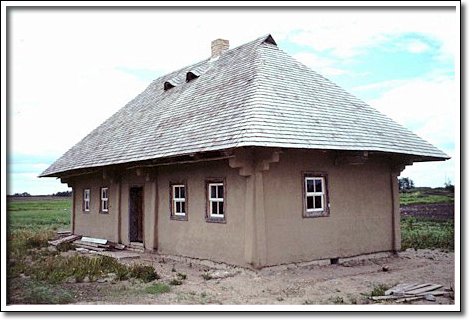 This former farmhouse is the last known example of a traditional Romanian-style residence in Manitoba. It was constructed in 1906 by John and Mary Paulencu with the assistance of noted local carpenter Alexie Slusarchuyk. The design originates from the Carpathian Mountain region of Eastern Europe, and therefore possesses similarities to Ukrainian houses, including a rectangular three-room plan with a centrally positioned door, and hip roof. The Romanian vernacular form, however, tended to be somewhat larger and more ornate. The Paulencu house was constructed of round logs with overlapping saddle-notch corner connections. At the upper portions of the exterior walls, the logs progressively extend out to form large brackets which help to support the roof’s wide overhanging eaves. The Paulencu house has survived largely intact and is the last of a community of similar farm residences constructed on adjoining homesteads by family members and friends.